There are many ways to maintain a healthy and sanitary office space, from sweeping away clutter to simply throwing trash in the proper garbage receptacle. However, one of the easiest ways to keep offices clean and sanitized is by having antibacterial wipes available. Antibacterial wipes are single-use wipes that are pre-moistened with an antibacterial solution. They come in an easy-to-carry dispenser like a pack or tub and can be found in many retail stores. Though antibacterial wipes aren’t superior to the latest cleaning technologies, they do offer advantages that are beneficial to employees and offices. Accidentally spilled coffee on the table? No problem. Just grab a few antibacterial wipes and wipe the table clean. Antibacterial wipes are quick and easy to use, just like your reliable roll of tissue paper. However, they offer a layer of cleanliness that no ordinary two-ply can provide. When antibacterial wipes touch a surface, they begin eliminating germs almost instantly. They also help minimize the spread of these hazardous microorganisms, sanitizing the area in a short amount of time. Most people might think that antibacterial wipes are only used for hygiene purposes (e.g. wiping of the face, hands, nose etc). However, antibacterial wipes can be used to clean your office materials as well. These wipes are capable of cleaning sticky pen holders, oily doorknobs, and anything that doesn’t look or feel clean to the touch. Antibacterial wipes also minimize the spread of sickness and viruses. If you’re experiencing the early signs of a cold, you can wipe your things with antibacterial wipes to ensure that no one in your office contracts the illness. Since antibacterial wipes are accessible and easy to carry around, it’s easy for office management to implement the product into the office cleanliness protocol. Management can supply their coworkers with antibacterial wipes around the office, espeically in bathrooms other widely used spaces. Antibacterial wipes are quick and easy solutions to everyday office dirt. However, they can’t take care of huge office messes or accidents. 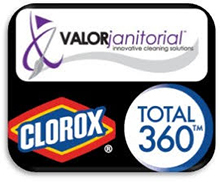 If your property in Dallas, Texas is in dire need of a good cleaning, contact Valor Janitorial. Our professional office cleaning service will make your property spotless in no time. Give us a call at 214-238-9550 to claim your free estimate.